Great substitute for coffee! I add in soy milk and it's wonderful in the morning. I was looking for something to replace my third coffee of the day, not so much replace my beloved coffee altogether, and Dandy Blend seems to be doing the trick. It's quite rich (I add a heaping teaspoon) and normally with coffee I take milk, but Dandy Blend doesn't need it. It's not bitter at all. All in all, I find the taste pleasing and like that I can have a cup close to bedtime and not worry about a caffeine rush. This definitely won't replace my morning coffee (or second!) but when my midday or nighttime warm beverage urge kicks in, it's perfect. I'm trying to find a good coffee substitute because I want to give up coffee and so after reading all the 5-star reviews about how delicious Dandy Blend is, that it tastes exactly like coffee, etc etc, I decided to give it a try. I expected it to taste a lot like NESCAFÃ‰ Encore Instant Coffee which has chicory in it and is absolutely delicious! To my huge disappointment, this tastes NOTHING like coffee - not even close and it doesn't have that beautiful chicory taste that I was so looking forward to. It is very bland and bitter even though it contains sugar beet (a healthier sounding way to say sugar). To make it taste remotely like coffee, I had to add sugar, a lot of cream, and then some vanilla otherwise it's like drinking dirty dish water. I really don't understand all the 5-star raving reviews. Maybe I'm the only person on the planet who doesn't like Dandy Blend, which should be more accurately named Dandy Bland. I ordered this two weeks ago to try it out, and I'm already back to order more because I love it so much. How is it so creamy and delicious? I LOVE the taste of coffee, but hate the way it makes me feel (anxious and jittery) - Dandy Blend has been the perfect substitute. I drink 2-3 cups a day! Knowing it's not only yummy, but good for me too? Double win. I don't think I will ever drink coffee again. This product exceeded my expectations. The powder dissolves into a rich, smooth hot drink without any acidity or bitterness. It's cozy and perfect with a splash of milk. I prefer to use a heaping tablespoon rather than the recommended teaspoon for a stronger drink. Will repurchase. Iâ€™m a real coffee lover and former Starbucks barista and this coffee substitute tastes so similar to coffee, itâ€™s perfect! Coffee was giving me serious heartburn and dandy blend doesnâ€™t give me any symptoms. I gave up coffee last year September, but as we are getting closer to the hot summer days I was looking for an alternative for ice latte. This product is just great! It has the coffee smell, the light coffee foam when it is made, and the rich coffee taste. I drink it 1:1 with cold almond milk and don't have the curdling problem like I used to have it with real coffee. I don't drink coffee so, unlike most reviewers, I do not drink this as a coffee alternative. I drink it because of the wonderful qualities of dandelion root. I have a very sensitive stomach so I started drinking it in small dosages (1/4 cup for a couple of days and built it up from there). I drink one cup a day (one teaspoon per cup) and have not had any stomach problems. It does feel heavy, though. As in I feel full after one cup. Totally recommend if you are into healthy eating! This was an experiment to see if this was a good coffee alternative, plus i heard how good Dandelion root was, so I tried the small packet as its not cheap. Well after having tried it I have sent off for the large pack, One of the benefits was to go regularly after several years of NOT.. and as for flavour, I was extremely pleased, and using whipping creme I had my own double double, plus NO TREMORS as I used to get with a couple of cups of coffee or more, and no problem dropping off to sleep at night.. When added to cocoa powder for a night cap it tastes of dark chocolate 85% cocoa, much nicer, Plus the amount you use it does go a long way so compares to coffee beans ,and no grinding or mess. Love it !! Excellent product that can be made a ton of different ways to make a drink that's just right. I love the richness and satisfying feeling knowing that I'm giving my body something nutritious. I prefer having mine with a half teaspoon organic maca powder and quarter teaspoon organic cocoa powder. I also sometimes use cashew milk and cinnamon for a full bodied warm drink. Enjoy! This is a great alternative to coffee! Tastes great and it is super easy to make. I bought this for my husband to try since he generally drinks way too much coffee and he has really been enjoying it and is down to only 1 cup of coffee per day. Since going caffeine-free, this has been a nice alternative to coffee. It's got the richness that you can't get with herbal tea, and mixed with almond milk, is a pretty great hot morning beverage. Dandy Blend tastes great and, most importantly, actually satisfies like coffee. It really helps with digestive issues because it does not have coffee's irritating properties. Unlike coffee, it tastes good with almond milk rather than regular milk or cream. Really tasty alternative to coffee, I don't think I'll ever be a regular coffee drinker again, it is a bit pricey but definitely worth it. Rich and smooth. Also works well in brownies as an alternative to espresso powder to deepen the chocolate flavor. Tastes yummy, very close to coffee -- I make it with heated almond milk for a latte alternative. A little bit goes a long way, so this bag lasts quite a while. Dandy Blend is the perfect coffee alternative for a completely satisfying cup of non java. This doesn't mean giving up coffee, but it not only is a tasty pre-bedtime drink to enjoy, I also get the health benefits of dandelion root and all the other delicious ingredients in this. 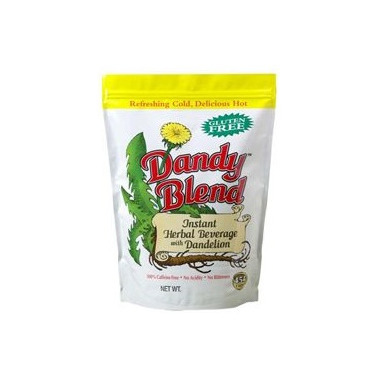 Dandy Blend is a cupboard staple I always have on hand. LOVE LOVE LOVE this product. It mixes well into hot liquids to make a mocha like drink (my kids love the mocha taste). It hides well in coffee and tastes pleasant. Definitely going to continue purchasing this. I have tried a lot of coffee substitutes, but this is the only one that has stood the test of time. I actually enjoy this as much as I did my coffee, but without all the side effects! Would highly recommend to anyone trying to cut back on their coffee! Excellent taste and texture. A very good product. I first started to use this product when i cut coffee out of my diet. It was only supposed to be temporary but Dandy Blend is such a GREAT substitute that I have continued to use it. Lovely "coffee" flavor without the caffeine or acidity. Definitely a must try. Great coffee substitute! I'm not saying you could mistake it for coffee but it does have a nice full flavour like coffee. I'm enjoying this coffee substitute. It has that nice earthy body that coffee has. I disagree with the claims that there are no side effects if you switch directly from coffee to Dandy Blend. I have been getting headaches, but it's a nice substitute nonetheless. I really like this powder. I keep coming back to it. I'm always looking for a nice coffee substitute. I like the Teccuchino product as well. This blend has a lovely smell of caramel or brown sugar. It has a lovely, unique taste as well. Not like moss or roots. Not like grass. It's nice.